Best songs by George Harrison, who would have been 75 this weekend . Beatles Radio: The Beatles, Solos, Covers, Birthdays, News The Fab 4 and More! 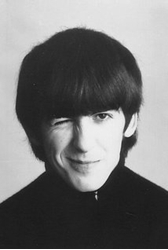 Former Beatles guitarist George Harrison would have turned 75 on Sunday, Feb. 25. Harrison was seen in various ways over his life. It is factual that he was the youngest of the four Beatles and the primary lead guitarist. He also was pigeonholed at one point as the quiet Beatle, then as a curiosity when he started inserting Eastern Hemisphere music elements, such as the sitar instrument and a penchant for personal reflection, into his songs. The period from February to April 2018 marks the 50th anniversary of The Beatles spending time with yogis in India. Beyond his Beatles years in the Sixties, Harrison had a wide ranging solo career. He dropped to a much lower profile after the late 1970s, then had a big comeback in 1988 with "Got My Mind Set On You" single and following work in the Traveling Wilburys supergroup, which included Bob Dylan and Tom Petty. Harrison died on Nov. 29, 2001, from lung cancer, less than two years after receiving wounds from a man who broke into his house and stabbed Harrison in the chest in December 1999. Here are the top four charting songs by Harrison as a Beatle and solo artist, plus five extras that should not be overlooked.